THANK YOU DI ORO FOR SPONSORING THIS RECIPE! 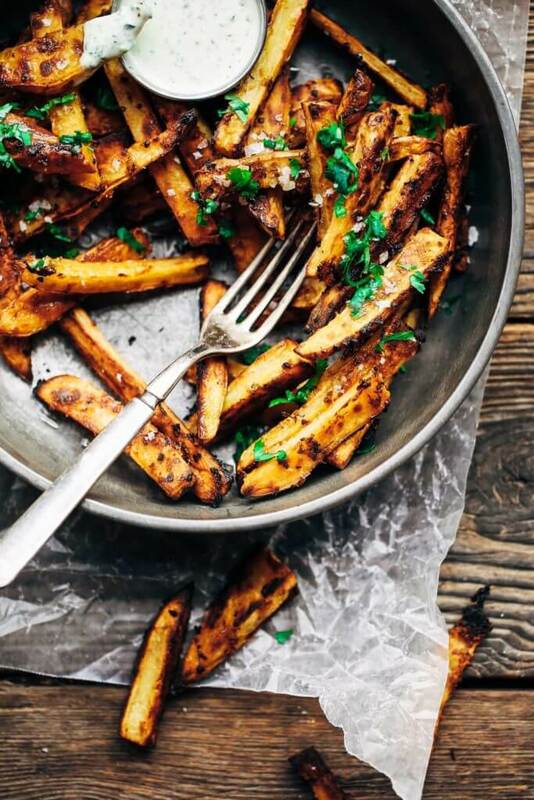 Want to know the secret to making extra crispy sweet potato fries? It’s all in the cooking time and amount of oil. Bake those babies long and slow with not too much and not too little extra virgin olive oil. Turn them halfway through to spread the crispness around to everyone. And then watch them bake and turn into beautiful brown munchies. *Pro tip: baking sweet potato fries is mounds easier using this Di Oro Living baking mat, which makes for crispy fry heaven and easy clean up. 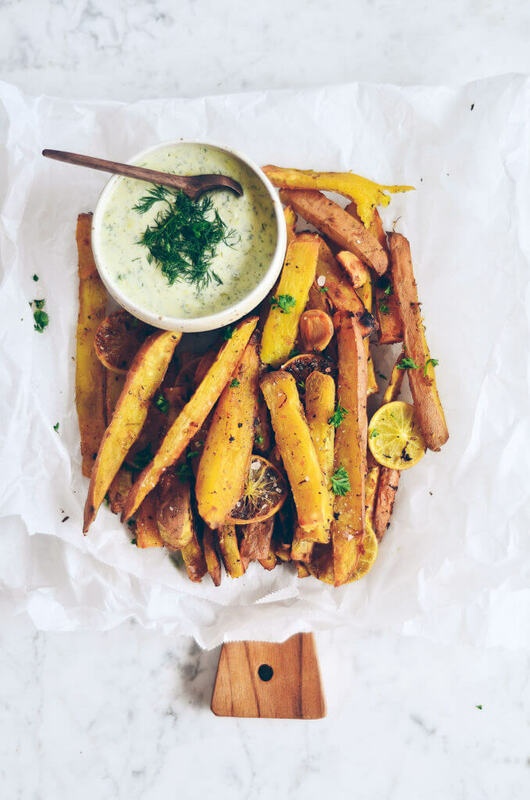 And what’s better than crispy sweet potato fries with ranch dipping sauce? 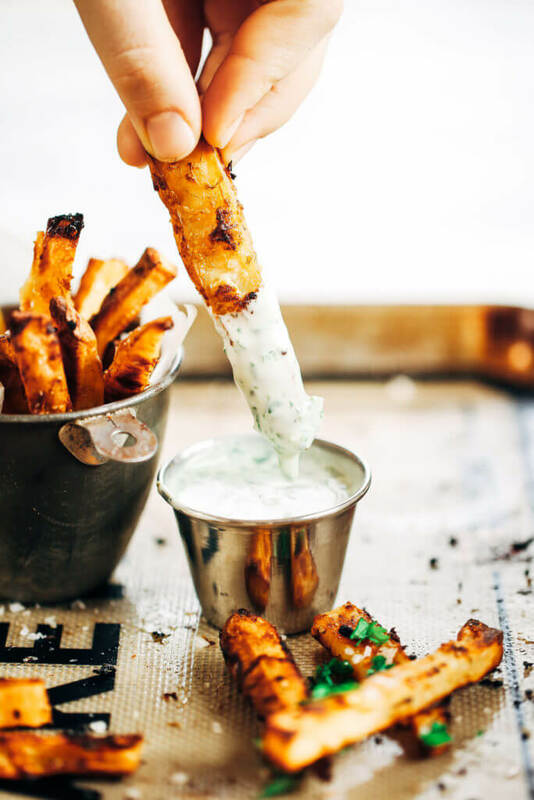 It’s crispy sweet potato fries with ranch dipping sauce and no clean up!! This baking mat also serves as the zero-clean-up part of the recipe, which, I’m a fan. Is there a bigger fan of sweet potato fries than myself? If so, please introduce yourself and we can battle it out in an epic showdown of fry eating to prove our devotion. 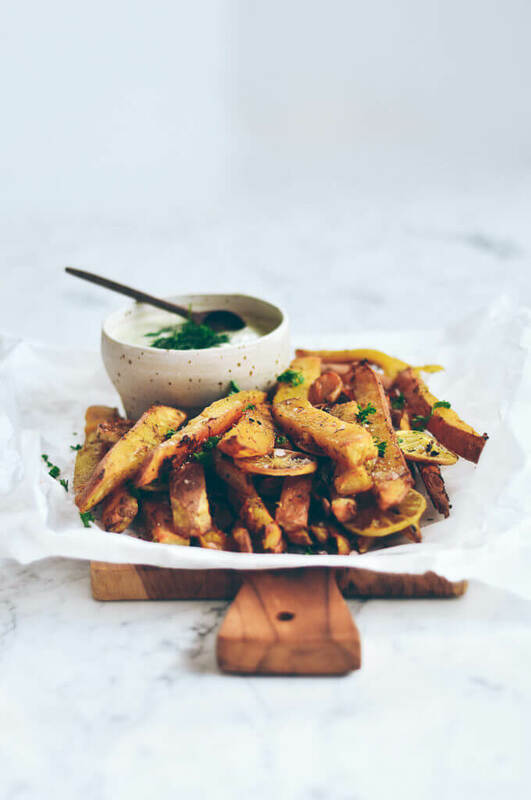 Naaaah, I’d rather just make a double (or triple) batch of these extra crispy garlic lime sweet potato fries. And eat them ALL BY MYSELF. love that lime and garlic! 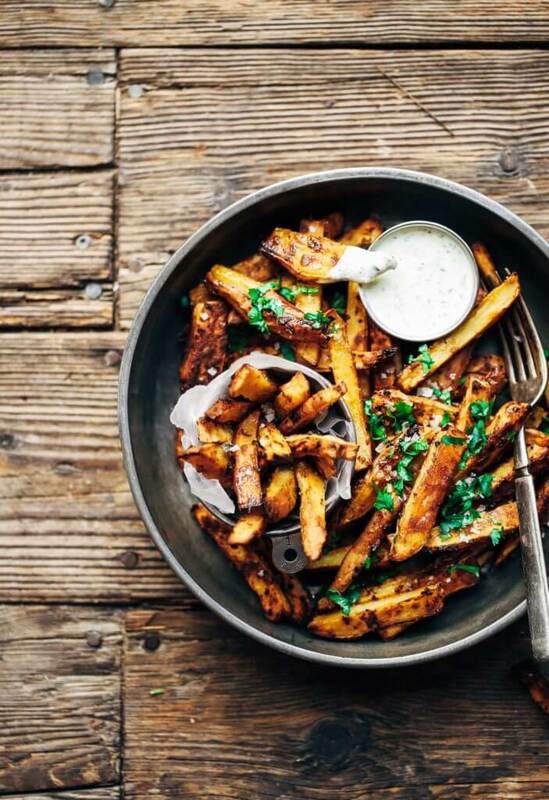 The loads of lime and garlic melting into these fries is unreal. 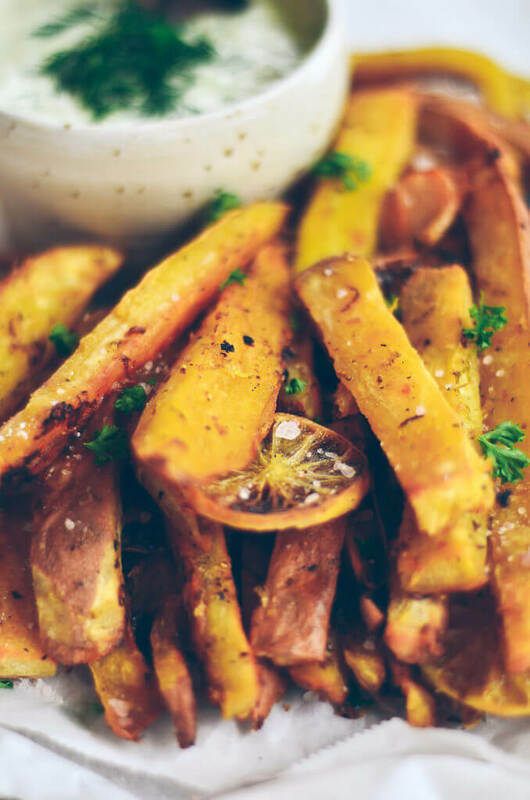 The zesty pop from the lime is a beautiful compliment to the sweetness of the sweet potato and spice of garlic. This sauce!! Creamy herby white sauce… also known as my favorite homemade dairy free ranch dressing! I make this recipe for the fam quite frequently and it’s always a hit. 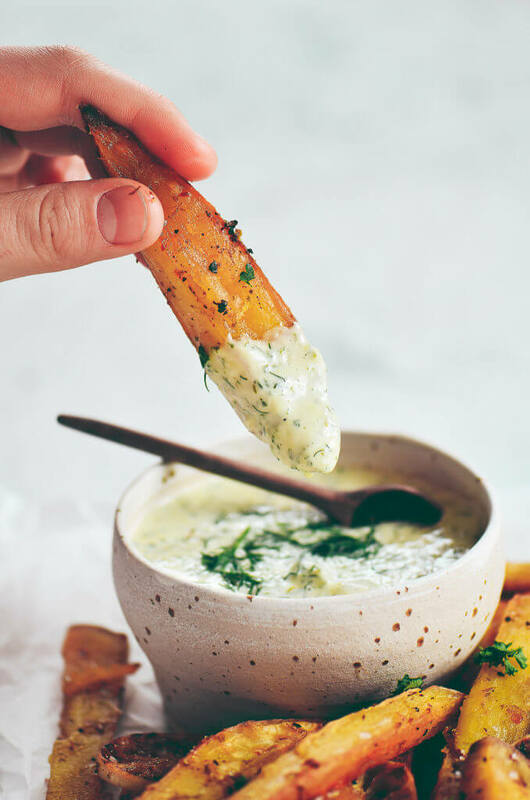 Plus, it’s the perfect side for dipping your crispy fries in. Since I’ve been making these fries on repeat (especially this week!!) a special sauce is definitely called for. Okay, time to eat! Thanks for inviting my recipes into your kitchen today, let’s get cooking! 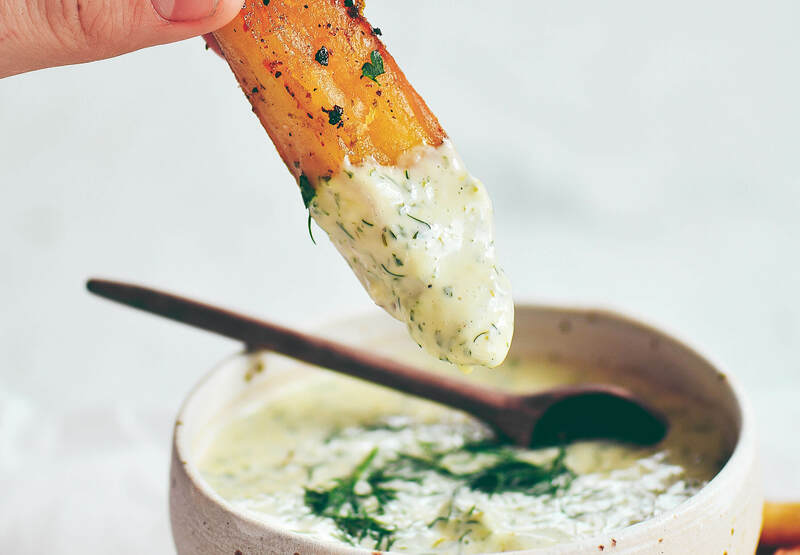 We cannot wait to try these fries and dipping sauce. I am almost drooling over it all just thinking about it!! Yay! Thank you! 🙂 Enjoy. So is that 3 tbsp of olive oil initially…bake for 20 min. then add 2 more tbsp of oil? Or is that tossing with all 5 tbsp of olive oil and then adding two more tablespoons? Just want to make sure I read that right. 😉 I could eat sweet potato fries daily! The white sweet potatoes are the best and I usually bake mine in a little duck fat. 🙂 Can’t wait to try these! Its 5 tbsp at first then 20 mins into it add 2 more. :)I know, the white ones are the best! Can I check, these cook for 90 minutes total?? Is it 1.5 teaspoons or tablespoons of salt? They sound wonderful. Must try them. Have to say I think your instructions are so straight forward that I can’t understand why people ask questions about things that are perfectly clearly written in black and white – or grey and white. I suspect some of these people are not real comfortable cooks… and they just need clarification so they can use a new recipe with some sort of confidence. They just need an answer to their question, not critique. Just a thought. In ingredient list you mince garlic and zest lime, then in directions you say to remove whole garlic and lime slices…what am I missing here? Which way do you make it? Thanks! There are both! 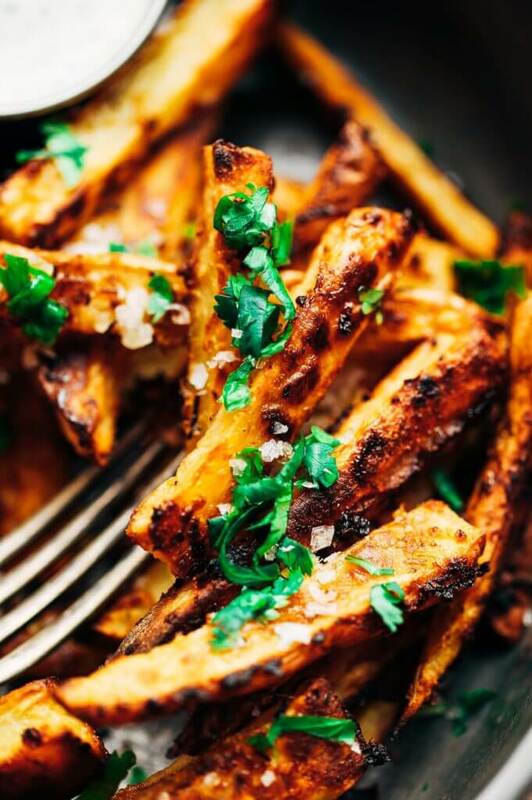 I mix the fries with zest and minced garlic and then roast them with whole slices of lime and garlic- does that make sense? Agree with Maryl above – the directions are NOT very clear about when to add the whole garlic and lime slices, or what you do with the lemon juice? Is that part of the “seasonings?” The directions actually say the cloves and lime slices are “garnish,” which would not typically mean added during cooking. I’d love a more clearly written recipe! When did you add the garlic (minced and whole), lime zest and slices, and lemon juice? At the beginning of the first bake? 90 min turned out way too long. They weren’t crispy. They burnt. And I was so looking forward to this recipe. 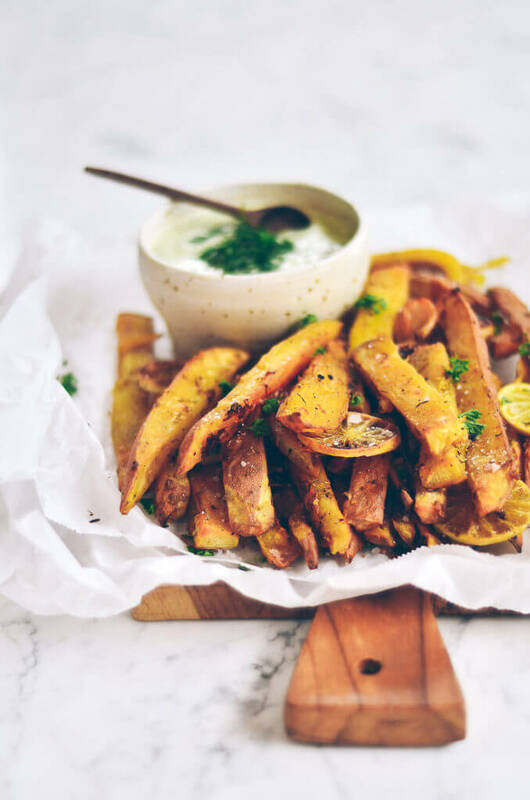 🙁 I am yet to find a recipe with crispy sweet potato fries. Hmmm, must have been the difference of ovens. Mine took 90 mins, but your may have to cook for less because of your oven. Thanks! maybe the size of your sweet potato slices were smaller than the recipe, and could account for the fact that they burned?? This looks awesome! I am going to try it asap, and I may even get my husband to eat sweet potatoes with this recipe, He is a garlic fanatic. It’s even in the dipping sauce! Beautiful photography! This is the best recipe! I made these tonight and they were fantastic! The sauce is AMAZING! 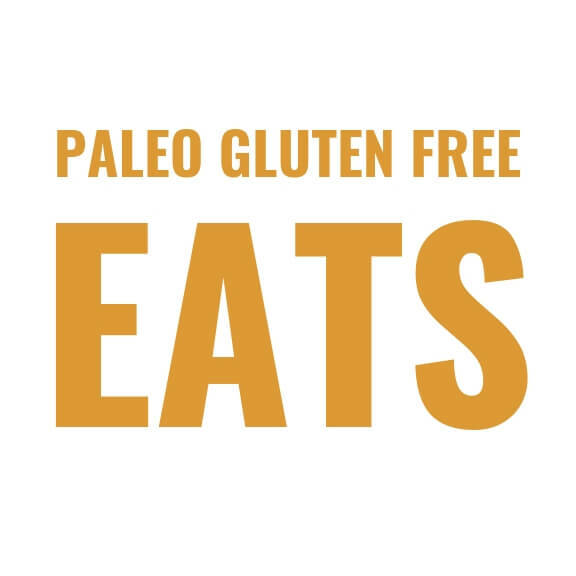 Keep up the incredible work creating yummy recipes. Thank you for sharing your talents! Do you think you would be able to make a lot a save for future days? I meal prep on Sundays, so wondering if I could only make these for one night of dinner or if I can make enough for a few days? What do you think? Hi Trisha, I do store sweet potato fries in the fridge for a couple days though. Also freezing could work. What was the recipe for the dipping sauce ? What kind of sauce is that with the sweet potatoe fries? Looks so yummy! Made these last night….there must be something missing from the page because I don’t see any instructions about the whole garlic or lime slices (other than in your pictures and from other commenters). Also, nowhere does it say anything about cooking them for 90 minutes or tossing the oil in at two different times throughout the baking process (again, other than reading other peoples comments. Very disappointed that they weren’t crispy (despite cooking for 70 minutes and putting under the broiler at the end). The ranch sauce was amazing though. Made it with regular mayo instead of paleo and it was a huge hit! I’ll try to make the fries again with a 90 minute cook time and tossing in oil 2 separate times….fingers crossed and thanks for the great ideas! Just put in the oven! Very excited! Can’t figure out how to get the sauce recipe? So, so good! Much easier than I thought they’d be also. From some of the comments I read I thought I’d have to watch them like a hawk when they were cooking. Some said they cooked too quickly, some said they took forever to get done. Mine were perfect cooking according to the recipe. I will definitely make them for a party some time. I have made these at least a dozen times now….slightly addicted! I’ve found mine take between 1-1/2 to 2 hours to crisp up, depending on the cut. They even reheat well the next day! So good…worth the time if you have it. So good to hear, thank you Kelly! I have made these several times now and they have been amazing every time, although I cannot get mine to crisp up perfectly (still working on this). The flavor is outrageous!!! I topped mine with carnitas and it was heavenly!! Thanks for the great recipe!! For those who can’t get their fries crispy, it is possible you’re using the orange sweet potatoes and not the white. The white ones have a milder flavor and less water. These were so good! I didn’t add the flour because I was without it tonight, but used everything else, and simply delicious. They were great with our grilled deer tenderloin! Thank you! This was seriously one of the BEST recipes I’ve had while on whole 3O! It is amazing!!! I didn’t make my fries one layer so they weren’t as crispy as I would have liked but the flavor is YUMMY!!! This is one I will make again and again! Thank you! should you peel the sweet potatoes? What can I use instead of tapioca flour? I have almond flour & coconut flour in my pantry right now. I was hoping to make these tonight with a substitute until I can get the tapioca flour? Hi Christy, you can use arrowroot flour in place of tapioca. When do you use the tapioca flour??? Decided to take my health journey serious this time around and I made these today and they were amazing! I think I’ll making these at least once per week. Love them! Hi Sharyl, orange sweet potatoes/yams will totally work too! Enjoy! These look amazing! Is the tapioca flour essential or do you know of a substitute if it is? Hi Sara, you can leave it out and they will still be tasty!